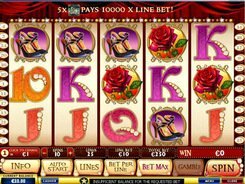 La Chatte Rouge is a Playtech-developed video slot fitted with 5 reels and 25 paylines. Its regular symbols are Cabaret dancers, wine, shoes and roses. You can bet a maximum of 10 coins per line and change a coin size from the $0.01 bottom to $5. The top bet is $1250. If you placed the maximum bet and hit five wild symbols (the Wild logo) on an active payline, you win 10,000 coins, or $50,000. In addition, the wild can replace missing symbols to create winning combinations. The Cabaret dancer scatter also yields payouts when at least two appear on the reels. 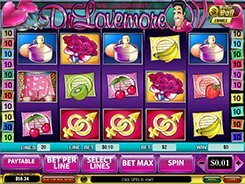 Three or more scatters start a free spins round. Before the free games start, you should select one dancer out of five. Each of them can award you with a specific number of free spins. The Rabbit in a Hat symbol hit on reel #2, #3 and #4 at a time starts the Magician Bonus feature. You have to select a white or a black rabbit. Then, the magician pulls nine rabbits out of his hat. Your bonus payout will depend on the number of rabbits of the chosen color pulled out from the hat. After each winning spin you have an option to trigger an easy-to-play Gamble feature. You have to choose a color (red or black) of the facedown card. If you guess the correct color, your winnings received in the triggering spin will be doubled. Otherwise, you will forfeit the winning amount. PLAY FOR REAL MONEY!